You’ve seen Dinah Lance as a reluctant team leader in Birds of Prey, a district attorney following in her sister’s vigilante footsteps on Arrow and as a smoky-eyed torch singer in the DC Comics Bombshells. But you’ve never seen her drawn by Annie Wu before, fronting an alt-rock band on tour and fighting off martial arts assassins and crazed fans alike, like she is in our brand new Black Canary comic. 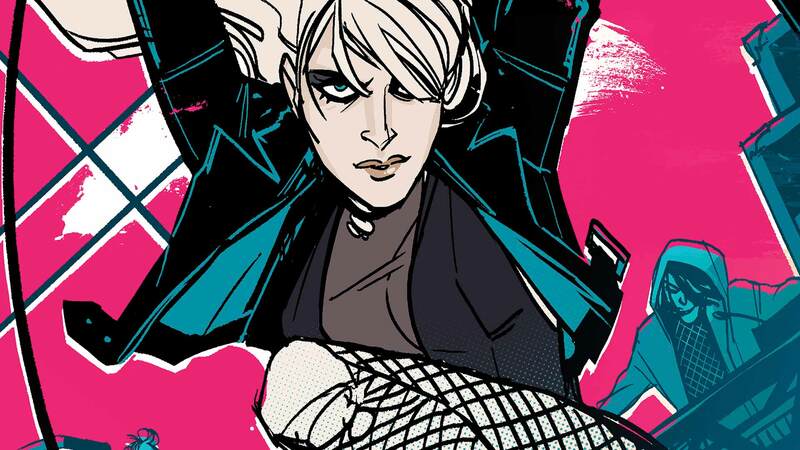 Spinning out of the pages of the already successful new Batgirl, this Black Canary is primed to become a favorite of new and longtime readers alike, in no small part due to Annie’s stylish, bold art. A newcomer to the main DC Universe, we were curious how Annie got involved with the new Black Canary. Turns out she has quite a few things in common with Ms. Lance…minus the crime-fighting and ear-shattering scream, of course. Annie, how would you describe the new Black Canary series? As [writer] Brenden Fletcher so perfectly pitched it, it's a rock 'n' roll kung-fu road trip. We're getting an opportunity to see Dinah in a new light while also reminding the audience just how brutal she is as a martial artist in the DCU. How did you get involved with the title? Were you much of a Black Canary fan prior to getting started on it? I assume I came to mind for Brenden and the editors because I wear all the things I love on my social media sleeve... I'm a comic book artist with super hero experience who loves music, performance, fashion, mean faces and cool hair. I met with Brenden in the early stages, and I loved the pitch and realized we had a lot of influences in common. I didn't know much about Black Canary, but after a crash course, I've fallen in love with her. Your art style really fits the tone and topic of the comic, but it’s not what you’d call a traditional super hero style. Did you always have an interest in drawing comic books? I enjoyed comics while I was in school, but I never really considered it a career option for myself. I figured the closest I'd get would be doing covers here and there. It wasn't until the community started responding to my work that I realized there might be an opportunity. I'm pretty sure this is the best way it could have worked out, because if I had obsessively worked towards a career in comics as an art student, my influences wouldn't be as diverse as they are now. I really love Black Canary’s new look. Did you design it, or was it already set when you came onboard? There weren't any notes on her costume when I started, so I just ran with what I wanted to do. Right away, I decided to recapture a bit of her old-school vibe, bringing back the bodysuit, jacket, fishnets, and boots. It already feels rock 'n' roll and she can totally fight in it, so why not? At the same time, I didn't want her to be a performer with just one outfit, so I suppose my main contribution was giving her a motif rather than a single costume for this run. It's always some take on that combination. She's supposed to come off like a rock star with endless outfits while also feeling very iconic "Black Canary." The fishnets help. How’s the process been working with Brenden Fletcher? Do you have a role in the scripting and dialog, or is that all him? Brenden's great. He's been very encouraging about the process being a conversation, reminding me he's happy to write whatever I want to draw or incorporate dialog. I've been hesitant to throw in too much because he so thoroughly knows what he's doing. I think in Issue #1, there are two captions that I contributed because I thought we could use the visual balance—I'm sure people who are familiar with my sense of humor can identify them pretty quickly. But for the most part, I try to stay out of Brenden's way because he's got those storytelling chops. Music is such a big part of this series. How important is music to you? Have you ever played in a band? I absolutely love music, all kinds. For a good chunk of my childhood, I wanted to direct music videos, so my brain still visualizes scenes like that—most characters and beats have songs mentally assigned to them. That said, I have no rhythm and am awful at playing music. I've been trying to get back into guitar so that I can be as Daniel Day-Lewis as possible with my process, but I'm still terrible. I was in a band in middle school, in the sense that we were a group of kids who all owned instruments and called ourselves a band. All our "songs" were joke-y—the only one I can remember was called "Subliminal Messages," where we prefaced it with a warning about, y'know, subliminal messages and then shrieked awful things for thirty seconds. We thought we were hilarious. Super heroes in Gotham usually operate at night, which is usually when bands play their sets. How do you think Dinah balances the two? After the events of this last Batgirl arc, Dinah's broke as a joke, so her current priority is to fulfill her contract, earn her music money, and get her life back. She'd be happy to get through a set uninterrupted, but trouble seems to find her band all the time and she's the only one who can protect them. Between basic rock show drunkards and genuine super-threats, it's a fun mess. How would you describe Black Canary’s sound? Is it pretty mainstream, or is it out there and edgy as hell? Brenden and I have discussed this a lot because we're both music nerds. I told him early on that my instinct is to have the band's aesthetic lean a little goth-y, and I think we were both immediately on the same page. Brenden's an actual musician so I'm sure he's approaching it with a lot of clarity, whereas I'm sort of approximating a sound by Frankenstein-ing bands and songs I love. I hear a touch of that dark 80s thing with a modern electronic sound. Throw in the occasional super-anthem to close out the show. This book is gonna be a weird, fun time! BLACK CANARY #1 by Brenden Fletcher and Annie Wu is now available in print and as a digital download.